Palm oil is obtained from the seeds and pulp of fruits from African oil palm. It is very thick oil, which in room temperature has a form of butter with orange colour. For this reason (just like coconut oil) it is sold in jars (to get it out of the bottle with a pump or atomiser would be simply impossible). 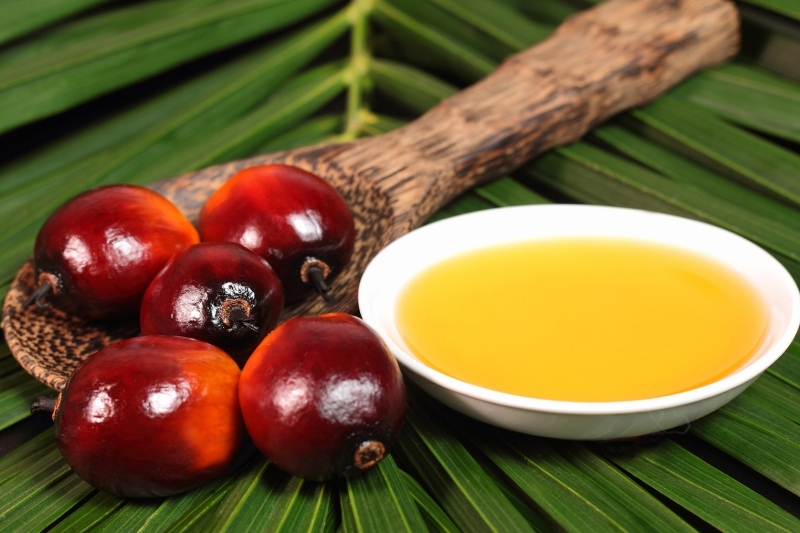 Palm oil is dedicated for care and nourishment of low porosity hair, because it is drying oil with small particles. In its composition the advantage belongs to saturated fatty acids. Palm oil is a unique oil, that as a one of few consists of such a high concentration of beta-carotene (this is where its orange colour comes from). Beta-carotene contains natural UV filter, that protects hair against harmful impact of sun radiation, inhibits ageing processes of skin and hair, normalises work of sebaceous glands (great for oily and overly dry scalp). What is more, beta-carotene in the composition of palm oil stimulates production of collagen fibres, that with age weaken leading to skin losing the elasticity. Its production with time decreases drastically. Beta-carotene supports right functioning of collagen in the dermis. This is not the end of beneficial properties of palm oil. After all, it contains coenzyme Q10 and vitamins A and E. Coenzyme Q10 takes part in the cellular metabolism and supports transport of oxygen to cells. Vitamin E – called the vitamin of youth – supports beta-carotene and coenzyme Q10: eliminates free radicals, improves transport of nourishing ingredients into the cells and is responsible for the growth and gloss of the hair. Its deficit can cause keratodermia and premature ageing of the epidermis, but also stop hair growth and cause hair to be brittle and matte. Vitamin A has direct impact on the renewal of the cells in our organism and additionally protects hair against intense sun, freeze, cigarette smoke and strong toxins that can penetrate hair structure. The deficit of this vitamin can result with hair loss. Palm oil is liked by all ladies, who fight skin and hair ageing, but also these who suffer from excessively dry or oily scalp. Hair, that are thick and with sealed cuticles require specialistic care with oils that have small particles able to reach inner structures of low porosity hair. Palm oil should be applied on hair and scalp (carefully, so that not to overdo with the amount – equivalent of one table spoon is an optimal amount of palm oil used for hair oiling). Just hold it for at least an hour on hair and rinse it with delicate shampoo. Attention! Due to orange colour, this oil can change hair colour of blonde hair. For this reason palm oil is dedicated most of all for ladies with dark, brown and red hair.